This finishes my food habits. I haven't written up spacefood as a habit, I guess I could do that. Also afternoon snacks, though that's just fruit or nuts. I have enough things to think about and there are enough things that can be eaten as is that I don't have to be prepping every last thing that goes into my mouth. Writing all these up was a little kobayashi maru, being that I already had most of these well in hand. Though there was a time that I didn't, and to a large extent I've worked them out in these very friendly confines. Anyway what I've worked out is that the way I do, which works for me, your mileage may vary, is to make habits out of what I eat when. It saves on decision fatigue, I've been doing this for so long I can't imagine debating what to eat at every mealtime. It's not that I put less thought into what I eat, obviously not, circumspicere. It's more that I put more thought into fewer decisions, I sort of globally decided that it would be eggs for breakfast, chicken for lunch, nuts for afternoon snack, meat or fish for dinner, and greek yogurt for post-workout snack year round, and then I decide quarterly what particular egg, chicken, nuts, meat and fish, and greek yogurt recipes it's going to be for the next thirteen weeks, and I'm getting to be able to repeat previous years' recipes, so even less thinking going forward. I mean, things fall apart, the center doesn't always hold. And it's almost never a smooth transition, it's always that squealing brakes sound when all of a sudden I'm sick of everything that I've been happily chowing down for twelve weeks, and then usually there's a week in there of coke and chex mix for lunch and a pint of cherry garcia in bed. No worries, I chalk it up to part of the process. The cue for greek yogurt and fruit is getting home from practice, obviously. Sometimes I don't go straight home, sometimes I go out with my team and then I try to have something of a protein and vegetable nature—like fish tacos on lettuce at The Beetle, but you know sometimes it's wings and tecate at Five Star. But anyway I do pretty much always refuel within 45 minutes of working out, I go way back with that—you can poke around for more info about that. 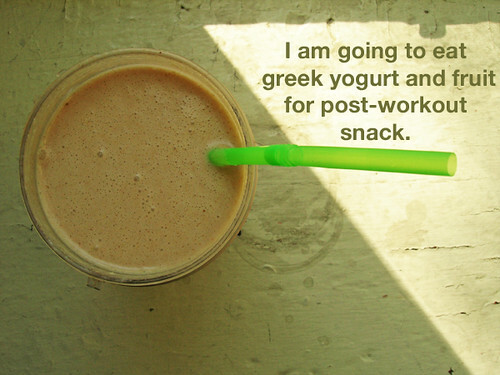 It was the pumpkin smoothie that clicked everything into place, everything greek yogurt anyway. So it's going to be pie smoothies for fall, which includes pumpkin, apple, key lime, and Mimi just invented a SWEET POTATO smoothie that I want to play around with, woah. Winter is going to be greek yogurt with baked fruit, spring is going to be greek yogurt with fruit compote, and summer is going to be greek yogurt fruit smoothies. Fruit smoothies don't require any prep apart from getting groceries, pie smoothies take a little bit, and baked fruit and fruit compote have to be made ahead of time, but the point is that everything is ready to be grabbed out of the refrigerator or freezer as soon as I get home. Now that I'm thinking, this is true about most of my meals, my refrigerator is jam-packed with mason jars. So really the routine is in the prep, which you can read about in my cooking practices. At the point of sale, so to speak, eighty to ninety percent of the time I'm grabbing a jar and eating what's in it. So really the cooking practice is the habit, and having everything ready to eat is the reward. I do also put thought into everything being delicious, eating for fuel and eating for pleasure aren't necessarily mutually exclusive.